Two students were reportedly found to be involved in an exchange or purchase of a handgun and two rounds of ammunition on Tuesday afternoon. Mesa Police, administration and security personnel investigated and the gun was found in a student's backpack. Both students "will face legal ramifications" and a school District Hearing Officer will determine their school discipline, the district says. Police say the two students, both 14-year-old boys, were taken into custody and will be referred for misdemeanor misconduct involving weapons. The gun was not loaded, police said. A social media threat was also made toward the school on Monday, however, Mesa Public Schools officials say, according to police, the threat was not credible. The district does not believe the two incidents are related. ABC15 spoke to another student at the school who said he knows one of the kids involved. "I've never seen him come off as that kind of guy who would do anything like that or be in any kind of activity that involves a weapon, it was kind of a shock," said Callum Mackinnon, a senior at Red Mountain High School. 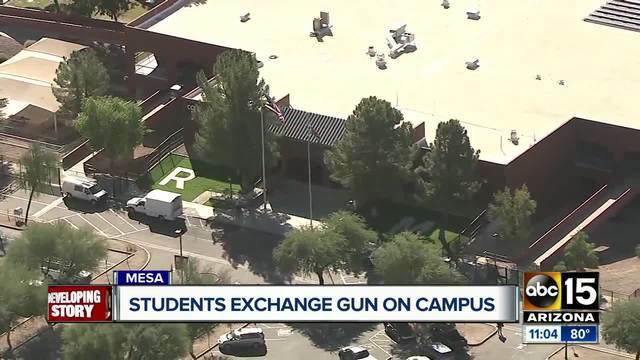 According to Mesa Police, another student saw the gun and sought help. "That's fantastic news that the students are aware of their surroundings, they're coming forward," said Mesa Police Detective Britney Brimhall.